SKU: iso100. Categories: Protein Powders, Sports Nutrition, Whey Isolate. Tags: Cycling, Dymatize Nutrition India, Fat Loss / Weight Loss, General Wellbeing, Lean & Toned Body, Marathon, Muscle Building / Lean Muscle Gain, Post-workout, Recovery, Sports Performance. Our fastest absorbing protein designed for the hardest working athletes. ISO-100® has everything your body needs to build and repair muscle faster, and nothing it does not. Each serving delivers 25g of hydrolyzed 100% whey protein isolate and 5.5 grams of Branched-Chain Amino Acids (BCAAs), including 2.7 grams of the BCAA L-Leucine, which are depleted during intense training. Its free of gluten and lactose, with less than one gram each of sugar and fat per serving. 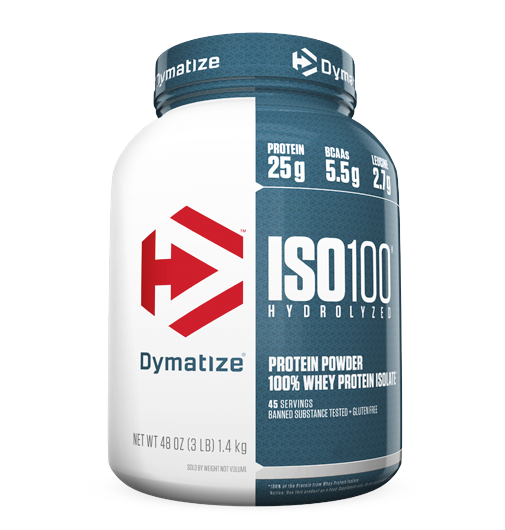 And since ISO•100 is comprised of hydrolyzed 100% whey protein isolate, you get all the nourishment you need almost instantaneously. ISO•100s taste has been improved, so every time you work out, you will look forward to your next shake. Directions: As a dietary supplement, add one heaping scoop to 12 ounces or 350ml of water, juice or milk. Mix for 15 seconds or until completely dispersed. For maximum results, take 2-3 servings daily.